Skeptical about the location, MacGyver checked the address against the GPS, Apple maps and Google maps. Sure enough, off the Interstate, off the State Highway, down a County Road, through farm country into the hamlet of Jonesville, a block from the church, next to the railroad tracks sits The Brick. Looking through the front window into The Brick. 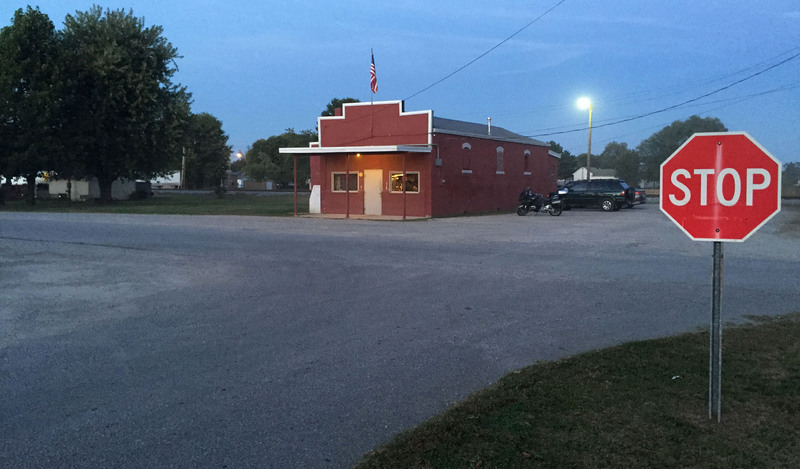 A popular Columbus, Indiana area bar, known for its great burgers, housed in a one-story, red brick building, built in the 1900s, next to the railroad tracks and down the road from the church in Jonesville. First opened in the early 1900s, the original wooden bar has been preserved. It became a gas station during Prohibition and in the 70s was given its current look, fake wood paneling, dotted with photos of the area and its residents, and naugahyde bar stools and booths. Forlorn country tunes blare from a jukebox in the back, competing with Fox News on the flat screen TV in the front corner. The fresh-off-the-grill cheeseburger deluxe with lettuce, tomato and grilled onions for $5.50, arrived at our table on wax paper, hot and juicy. The menu boasts two items, burgers or dogs, three sides, soup, chili, or chips. No plates. No cutlery. No deep fryer. The only downside, smoking allowed. Our meal last night was a sharp contrast to, and yet, in keeping with our delicious-meals weekend, made possible by Sabine, our BMW motorcycle. We rode Sabine from Cincinnati, Ohio to Greenback, Tennessee, south of Knoxville, to a 40th birthday celebration at Century Harvest Farms, a 350 acre farm owned by Christopher and Shona Burger. The farm uses organic and sustainable farming practices, like those common a hundred years ago, and specializes in producing East Tennessee 100% grass-fed beef, pastured pork, chicken and eggs and seasonal vegetables. The Burgers alternate crops, cultivate legumes and use the fertilizer produced naturally by the farm’s animals. 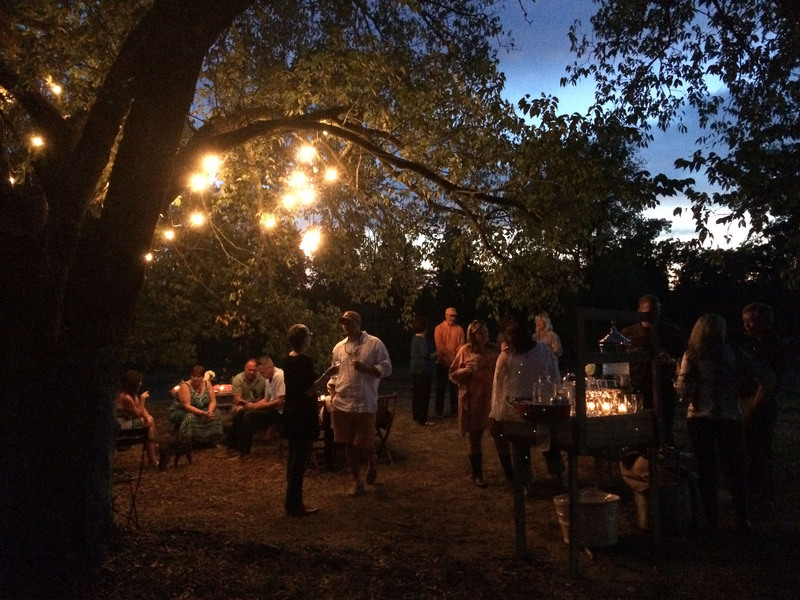 A magical evening at Century Harvest Farms in Greenback, Tennessee, just west of Knoxville. Guests invited to celebrate a right-of-passage, a 40th birthday, enjoyed a charcuterie featuring pates, salamis, savory jams and cheeses, bounty produced by the farm. Chef Dustin Busby, formerly of Blackberry Farm, who manages the farm’s industrial kitchen, conjured up a magical, setting for this outdoor feast in two parts — farm grown and made charcuterie and the main meals. Under a canopy of trees strung with white lights, Dustin served his farm specialties, pates, salamis and savoury jams, which are made on site and sold at the Maryville Farmers Market and online. 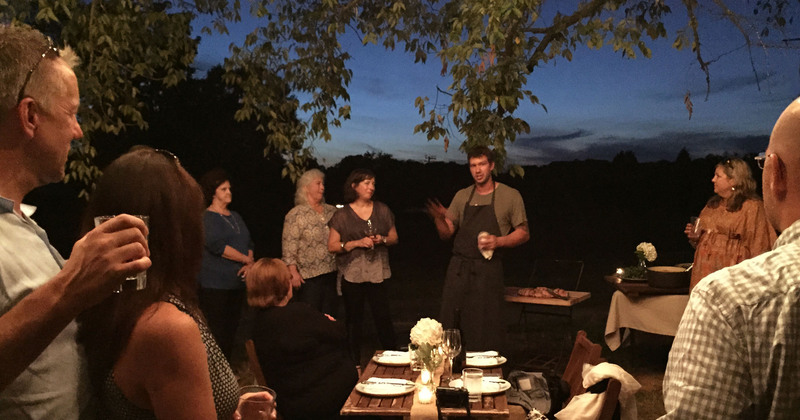 Chef Dustin Busby, formerly of Blackberry Farm, now manager of the Century Harvest Farms kitchen, explains the evening menu. Located in Greenback, Tennessee, the farm owned by Christopher and Shona Burger, specializes in 100% grass-fed beef, pastured pork, chicken and eggs and seasonal vegetables and uses organic and sustainable farming practices. The Burgers alternate crops, cultivate legumes and use the fertilizer produced naturally by the farm’s animals. Dinner featured pork loin, smoked chicken and fingerling potatoes, sweet corn with farm-made tomato jam, green beans and the star of the show pork belly. Slices of firm pork belly with a thin, crackling rind on each slice, sweet and tangy. If you’re in the Knoxville area, take a farm tour. This is the upside of the Year of Slow Freight, exploring the roads less traveled. Once again, you guys do it right ! Love the idea of stories re: roads less traveled. Makes me realize that I don’t do enough ‘snooping’ around when I take a trip. Love the pics and could taste those burgers. Definitely, this a place you’d enjoy. My only regret is that we should have taken a walk around the village before dinner. But we were starving. Did you stop in Circle, Montana at the Round Towne Tavern. 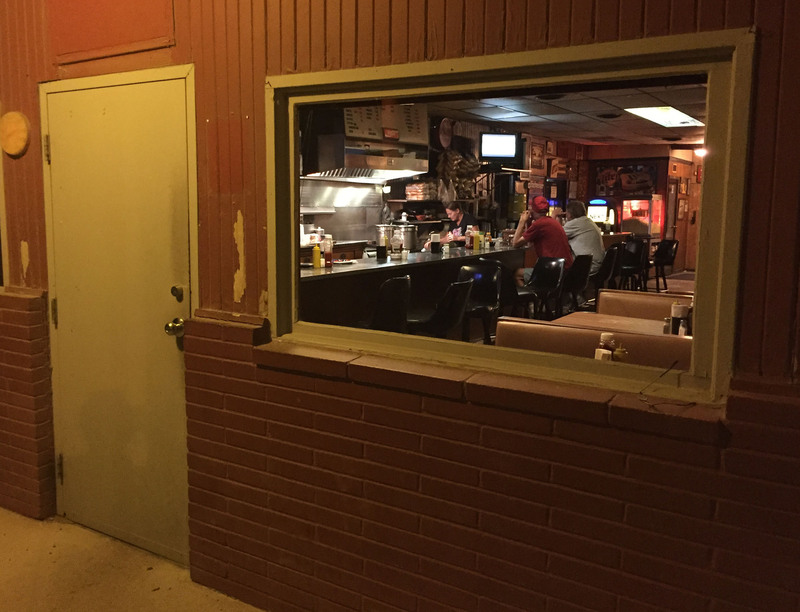 It’s Park Avenue compared to The Brick but still a great place to visit and enjoy a burger. Coolio. How do you know the folks at Century Harvest Farms? Looks like it was a magical evening. Good to hear about The Brick, too. Love your travels off the truck lanes. There’s a whole country to see out there; sad for you and others that freight is low, but you are doing the right thing! We are new friends of Century Harvest Farms by way of the party invitation. Our hosts have lived in Knoxville for several years. We loved everything about the evening, and we were honored to be included. It’s easier for us, than a solo driver and many teams, when freight is down. They are away from family and friends, but we are together and we can find something fun to do while we wait. Nice to see you haven’t lost all your journalist observation skills! High praise from you. Thank you. Wait, you now know 2 People named Shona? That’s what MacGyver said, I now know two people named Shona. The farm was given our excellent rating before we arrived just for its connection to a Shona. And it is a wonderful place. I totally agree with Big Momma, you guys know how to do it right and get the best of everything! It’s not often one falls into a way of earning money that suits them perfectly. Not that it’s flowers and unicorns all the time, it’s not, but we still marvel at well suited we are for this lifestyle. And, MacGyver is brilliant. He not only had the vision, he designed the garage for the tractor to hold an “escape pod.” Everywhere is accessible. That’s my boy…..brilliant !! He’s funny too. or there’s more than one? No question, MacGyver is the best concierge around. You will have to check Instagram @lifewithnofixedaddress because he is posting more photos. Yesterday’s is from Utah.